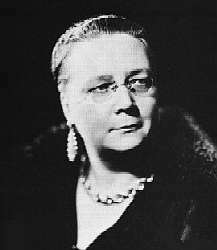 Dorothy L. Sayers was a British author, playwright, theological writer, poet and translator born in Oxford, England. She was a University graduate and enjoyed a number of successes in her writing career, especially including the creation of Lord Peter Wimsey, her very famous detective. She numbered among her friends T. S. Eliot and C. S. Lewis and is best known in Sherlockian circles for Unpopular Opinions, a book written in 1946 which featured a number of writings... of course, including writings about Sherlock Holmes. This volume is part of the Shaw Basic 100 and is listed in the Diogenes Club Required Readings. More information about Ms. Sayers can be found at the Dorothy L. Sayers Society.